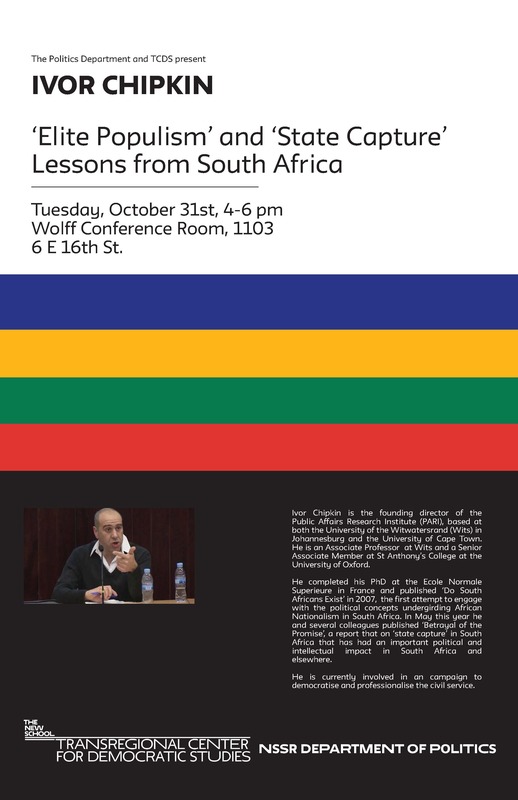 TCDS and the NSSR Politics Department Present ‘Elite Populism’ and ‘State Capture’ Lessons from South Africa a very timely lecture by Dr. Ivor Chipkin, Associate Professor at the University of the Witwatersrand in Johannesburg and founding Director of the Public Affairs Research Institute (PARI), on Tuesday, October 31st, 2017, at 4 pm at The New School, Wolff Conference Room, 1103, 6 E 16th st., New York, NY. Dr. Ivor Chipkin is the founding director of the Public Affairs Research Institute (PARI), based at both the University of the Witwatersrand (Wits) in Johannesburg and the University of Cape Town. He is an Associate Professor at Wits and a Senior Associate Member at St Anthony’s College at the University of Oxford. He completed his PhD at the Ecole Normale Superieure in France and published ‘Do South Africans Exist’ in 2007, the first attempt to engage with the political concepts undergirding African Nationalism in South Africa. In May this year he and several colleagues published ‘Betrayal of the Promise’, a report that on ‘state capture’ in South Africa that has had an important political and intellectual impact in South Africa and elsewhere. He is currently involved in a campaign to democratise and professionalise the civil service.